I devoured the Magic 2.0 books. I found them clever and at times laugh out loud funny. So I decided to pick this one up. I was not disappointed. The wit of the prior series was present and the characters were fun and well performed by the reader. The story is by no means earth shattering, but clever enough to hold my attention and definitely entertaining. Scott Meyer is best known for his Magic 2.0 series, which just hit four entries in length, in which a computer file allows geeks who figure it out to travel through time. The Authorities was his first attempt at breaking out of that series. The good news is that the best elements of Magic 2.0 are applied here as well. The not so good news (but not too bad) is that the story doesn't quite measure up. The story: A geeky Seattle cop is recruited by a famous gazillionaire to be part of a team of private investigators who use modern technology to solve cases (and social networking to self-promote). When a high profile psychoanalyst is murdered, the team has to investigate his group therapy patients to identify the killer, using their Bond-like tech and razor sharp wit to outwit the various and sundry crazies. This idea of a super-wealthy tech guru getting involved in policing did not fly well in the recent Fox TV show APB, canceled after one partial season (although this book was written before the show). On the other hand, the idea of looking a members of a therapy group did work well in Gregg Hurwitz's Tell No Lies (although without the humorous element). But the story is secondary for Meyer. His strength is creating a group of characters who banter back and forth as humorously as possible. As the title of my review says (a line from a Dylan song), The Authorities often just stand around and boast. This works especially well in audio with Luke Daniels narrating (not taking his voices too far over the top as in Magic 2.0). Still, a stronger story would've elevated the proceedings immeasurably. I came to this book after getting through all of the current Magic 2.0 books (which I loved) and was exploring other works by Scott Meyer when I came across this one. 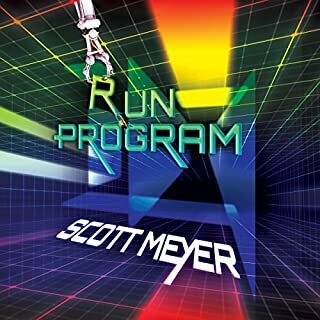 I loved Program Run (or was it Run Program?) and thought I would love this one too. Unfortunately, the humor in The Authorities is a bit different. In both Magic 2.0 and Program Run, the humor stems from two places: the sarcastic interactions between the characters, and the simple, stupid ways in which they act in what is supposed to be an otherwise serious situation. This book doesn’t lack either of those, but also seems to throw in some Office-like or Park-And-Rec-like awkwardness into the mix. I cannot stand cringe humor and I felt like the book had a lot of it. If you like that sort of thing, you will probably like this book. Humor is pretty subjective and it could have been the delivery of the narrator, though. Or maybe I didn’t get deep enough into the story to fall in love the character interactions like I did with the other books. What really earns it three stars is that the story took a little too long to get started and the pacing was a bit off. I lost interest after awhile. Maybe it gets better later in the book, but from the other reviews I surmise that it probably doesn’t. Overall, Scott Meyer is a damn good author, I will continue to read his books, but I’ll skip on this one. Laugh out loud awkward detective work. Yes. 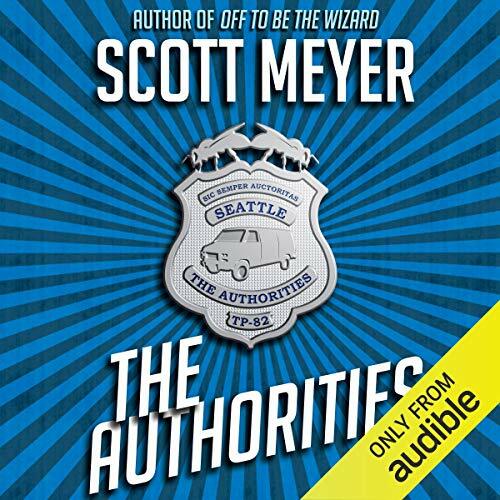 If you like mysteries, but really like those with colorfully goofy characters and humorously awkward situations, then "The Authorities" is defiantly a book that you would want to listen to. What was one of the most memorable moments of The Authorities? There was a scene where bees are first used as an bizarrely effective interrogation technique that was funny to listen to. There was a scene where the suspect was unsuccessfully trying to run, yet couldn't, so "The Authorities" had to sort of nonchalantly help the suspect out a little so they could get good video of themselves chasing him. It was read as so hilariously awkward and ponderous with narrator Luke Daniels' voice work that it became one of many favorite scenes. Oh there was much laughter. A healthy down to earth moment or two to round out the story and flesh out the characters, but mostly laughter. 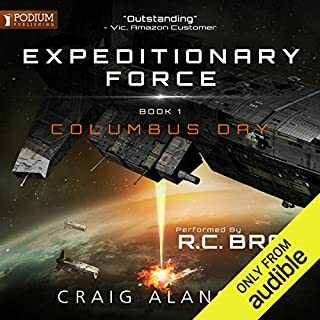 Author Scott Meyers and narrator Luke Daniels are quickly becoming one of my favorite audio book team. 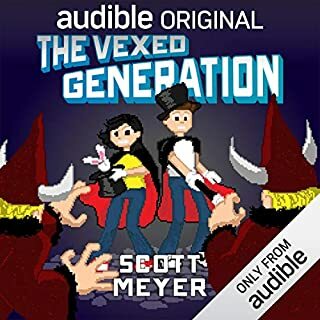 Scott Meyer's sense of ironically awkward and humorous character interaction situations only multiplies with the amazingly detailed and voice work of Luke Daniels. 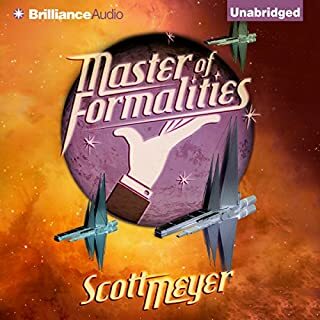 "Off to be the wizard" and "Master of Formalities" are also suggested if you enjoy Scott Meyer's sense of humor. What did you love best about The Authorities? Normally Meyers is great. In fact, he's one of my favorite authors for comedy. This fell sort of flat. It had its moments but they are few and far between. If not for Daniels this one probably wouldn't have been finished. If there's another in the series I'll get it if Daniels is reading but even so here's to hoping the story is better. Yes. He has an incredible sense of humor that translates well into everyday "human speak". All of it. If you haven't heard him try "Off to be the Wizard"-simply incredible! If you could rename The Authorities, what would you call it? Not sure anything else fits. Hi. Don't mind me. I'm just gonna stand here and beg for a sequel. I thoroughly enjoyed the Wizard 2.0 books (hope they don't stop). However, one issue with those books, is that it's about guys wanting to be wizards, which tbh limits the number of folks who would be interested just on the premise. The Authorities though has a similar comedic/wit element to the Wizard books, but is set as part of a light crime story - which even non-geeks can appreciate. Basically, I'll come across sounding like less of a nerd by recommending the Authorities to folks than the Wizard books, all while introducing them to a great story teller. The reflection that pedestrians being upset by them *not* being struck by Rutherford's driving his van. Absolutely love the wit of Meyer. I also liked the "laughing, laughing" by Sloan, and the explanation of why Max has three computers. Definitely Max. Although, this may be more because this was a more unique voice since it's not used in the Wizard 2.0 series. After finishing this and the Masters of Formalities one I think.. Scott should stick to Magic 2.0... This wasn't a bad book, it's just... bland. Nothing really interesting happens, none of the characters felt important. I miss the relatable-ness and humor. I really enjoy all of the authors books. They are are not masterpieces of literature but are definitely entertaining. This one is no different. It is a fun book though I questioned the plot at the end. The case was solved by good old detective work and had little to do with the gear or experience of the team. Still, the characters and writing made up for this shortcoming and I did enjoy the book. The Authorities is an entertaining, lighthearted police procedural, full of eccentric characters and gentle humour. In many ways, it is similar to the author's Magic 2.0 books - a simple, amusing story featuring endearingly socially inept characters. Luke Daniels' narration is excellent. His character voices really add to the humour. I was surprised by how much I enjoyed this. It's probably a 4.5 star rating. 5 stars for the fun factor, 4 stars because it's a bit unlikely / random. It's a "who-dunnit" with a difference. Socially awkward rookie cop not who wasn't quite fitting in with the local force, finds himself in an interesting new crime-investigating team. Eccentricity meets technology....what could possibly go wrong?! Similar light tone to the wizard books, but a very different theme. The humour is fun, the narration perfectly suited. Ideal when light relief is required between the more heavy-duty or emotional listens. the story was interesting and the. Characters with very engaging. pretty good listen but quite short. thanks. I have expected a more eventful journey, something alike Magic 2.0 first book. But still I enjoyed every chapter and hope to see the coninuation of The Authorities. Like Daniels adds lots of enjoyment with his experience in making the right tone to the ironic comments of the narrator. The start of this book is great. For about the first hour or hour and a half a big comedy moment is built up and executed perfectly. The blurb refers to it when it talks about a rookie cop arresting a suspect with an inappropriate weapon. I've read a few Scott Mayer books and I love his childish, prankish humour and with this one it was the same. I was walking along the street listening to the book and I couldn't control my burst of laughter, I thought that this was going to be his best book yet. I was disappointed, the initial arrest was not only the highlight of the book it was the only truly funny scene in the book. After the initial arrest I am pretty sure that I did not laugh for the rest of the novel - that's at least 8 hours of listening to a comedy with no humour. 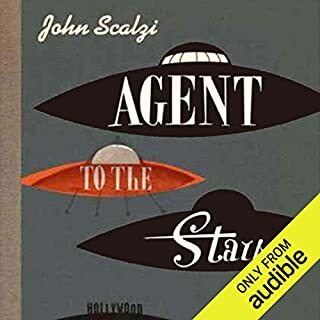 The Authorities does not work as a straight story and yet again with Audible I cannot account for how anybody can give this book a 5 star rating. Off to Be the Wizard is an example of what a 5 start comedy should be, funny from beginning to end - this is not. Scott Meyer does it again! I discovered Scott Meyer through his Magic 2.0 series. I loved them so much, I just had to explore Scott's other books. This book was fantastic! It had me hooked very early on, and i found myself finishing the entire book from start to finish while on holiday in Majorca. simply wonderful. a place procedural comedy. witty clever and modern. It took a wigletm suss that this war funny because the narrator was so deadpan would be nice to see more me the characters in another book. 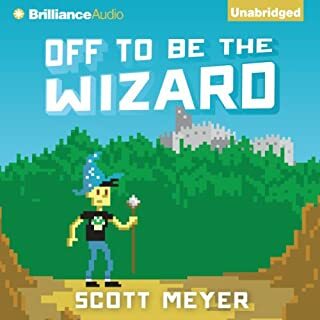 I read Scott Meyers &quot;Wizard&quot; books with varying levels of enjoyment. All have believable, three-dimensional characters, and all are at least mildly amusing. The fundamental stupidness of the plots is masked -- to a variable degree -- by the humour and the characterization. The Authorities did not succeed, for me, to the same extent as any of the Wizard books. The plot is as silly and unconvincing as the plots of the Wizard books, but most of the characters have little depth, and the interactions between the characters are often not very believable. It's still an amusing book, but not enough to overcome its fundamental daftness. Luke Daniels narration carries this book along, I think, as it does some of Meyer's other work. However, I sort of got the impression that his heart wasn't really in it this time. But that could just be by imagination. Authorities is not a bad book, and I wouldn't be deterred from reading more by the same author. I guess it just wasn't as good as I was expecting. I think the story could have used the wonderful characters a bit more. I enjoyed the story. A good, solid short story. Very interesting and didn't go on after it 'wrapped' everything up. Character interaction is my only downside, I feel they could have been a bit more developed.